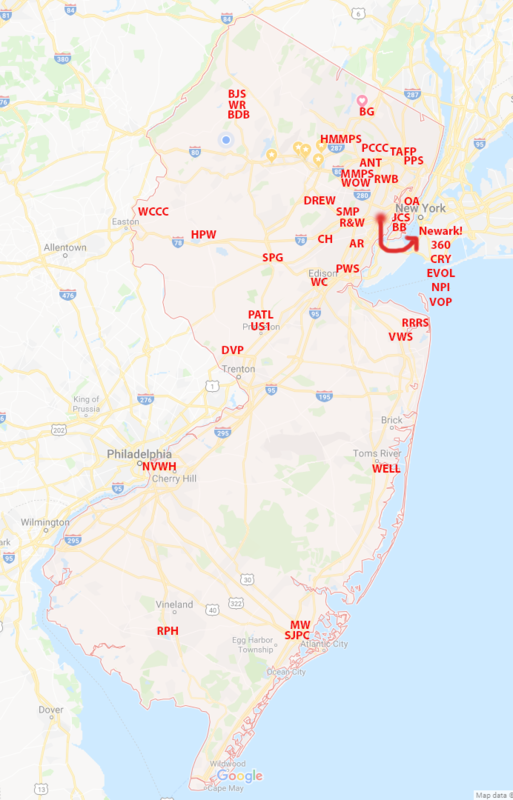 Below is a map of the active poetry scenes in New Jersey. If you'd like your scene added or changed, contact me at nowculture at gmail. 360 - 360 Poetry Night is a reading series in Newark. ANT - The ANT Bookstore in Clifton hosts poetry readings. AR - Atelier Rosal is a fine art store in Rahway hosting poetry readings. BB - Backroom Broadsides is a reading series at Fox & Crow in Jersey City. BDB - Black Dog Books in Newton hosts poetry readings. BG - Poetry Reading at the Barn Gallery is a series in Ringwood. BJS - The Betty June Silconas Poetry Center hosts readings and workshops and publishes the Stillwater Review. CH - The Carriage House Poetry Series is in Fanwood. CRY - CryOut Cave in Newark hosts poetry readings. DREW - Drew University has a poetry MFA program and hosts poetry readings. DVP - Delaware Valley Poets in Lawrenceville organize readings and workshops. EVOL - EvoluCulture organizes poetry events in Newark. HMMPS - The High Mountain Meadow Poetry Series in the Wayne Public Library is run by NJLC. HPW - Hunterdon Poets Workshop is a monthly workshop at the Hunterdon Art Museum. JCS - Jersey City Slam is a regular series. MW - Murphy Writing in Atlantic City runs workshops and retreats. NPI - The Newark Poetry Institute organizes poetry events. NVWH - The Nick Virgilio Writers House hosts readings, lectures, workshops, and more in Camden. OA - One Art is a reading series at the Issyra Gallery in Hoboken. PATL - Poets at the Library is a reading series in Princeton. PCCC - Passaic County Community College organizes readings and distributes the NJ Poetry Calendar. PPS - The Palisades Poetry Series in Teaneck is run by NJLC. PWS - PoetsWednesday Series is in Woodbridge. R&W - Rhythm & Words reading series is in Union. RPH - Resurgence: Poetry on High is a reading series in Glasstown. RRRS - The River Read Reading Series is in Red Bank. RWB - The Red Wheelbarrow Poets in Rutherford run the Williams Center and Gainville series and workshops and publish books. SJPC - South Jersey Poets Collective runs readings in Atlantic City. SMP - The South Mountain Poets host readings and publish anthologies. SPG - The Somerset Poetry Group hosts readings in Bridgewater. TAFP - Thursdays Are For Poetry is a reading series in Teaneck. US1 - US 1's Poets' Cooperative runs workshops, readings and publishes anthologies. VOP - Voice of the People is an open mic series in Newark. VWS - The Visiting Writing Series is in Brookdale Community College. WC - Writers Circle is a monthly workshop at the Highland Park Public Library. WCCC - Warren County Community College hosts reading series in Washington. WELL - The Well is a coffeehouse in Bayville that hosts poetry readings. WOW - Words On Wednesday is a reading series in Montclair. WR - Writers Roundtable is a reading series in Newton.